…makes an ideal perfect solution for a birthday, anniversary, wedding, business gift. You will find each luxury chocolate box different, trimmed with beautiful hand tied chiffon and satin ribbons. After all, why not treat someone special to some luxury once in a while. 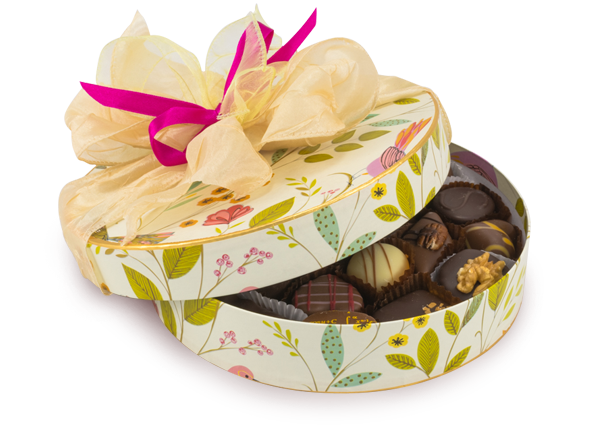 This single layer luxury chocolate box contains over 20 truffles. Our luxury boxes are filled with chocolate truffles to tempt the taste buds. Indeed, some melt in the mouth whilst others are crunchy. In summary, all of them will appeal to the most discerning palate with their sumptuous taste.